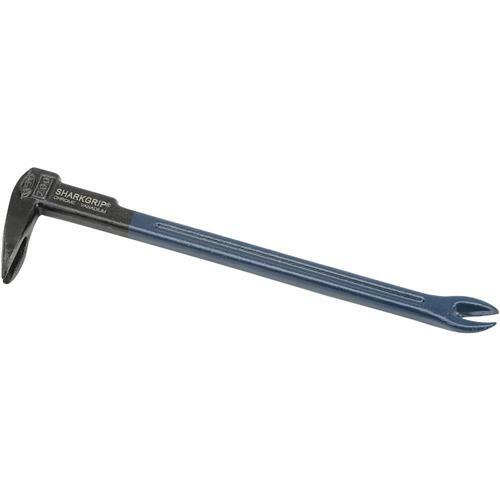 All SharkGrip® nail pullers and prybars are forged from the finest heat-treated Japanese alloy steel; the nail-pulling and prying ends are double-tempered for added strength. The pulling "V" is hardened to a Rockwell 50-52 hardness, then hand-finished for accuracy. The resulting tool is so strong it can even bite into hardened and stainless steel nails. SharkGrip nail pullers pull from the shank of the nail, not the head. SharkGrip Japanese "cat's paw"-type nail pullers have been the choice of professional cabinetmakers and woodworkers for years because they're so effective and easy to use. They easily dig into wood to catch even headless nails. Especially with the proliferation of pneumatic nailers, it’s essential to have a genuine SharkGrip nail puller in your tool kit. 7-5/8", for finish nails (3-6 penny).